While the cruise was a lot of fun, I'm glad to be back home with the kids (mostly, it was a rough morning). I didn't plan much for craft day with Little Miss today because I'm hoping she'll join me outside this afternoon as I get the garden ready. It's looking very ugly. Ugly enough that I have no interest in keeping it real and showing a picture. You all know what winter does to gardens. No visuals necessary. 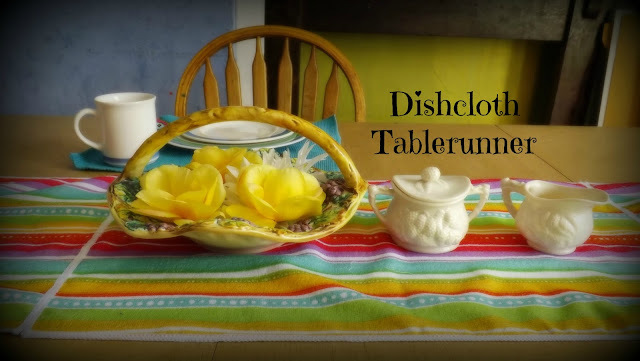 This tablerunner is made from dishcloths: the cheap kind found at the dollar store. My table seats 8-10 without the second leaf. I used 5 dishcloths and stitched them together with a zigzag stitch. The advantage of stitching it down this way is it is flat. If you do sides together, you end up with a seam. If you select dishcloths with a directional pattern, make sure all the cloths you have match end to end. You don't want to end up with a straggler that doesn't quite match and have to hang off the end of the table people don't see unless they sit down. Not that I'd know anything about that. So glad that you had a great time. We loved our Christmas cruise. Can't wait to start holidays tomorrow again. LOVE the runner. Hi, Micki - that turned out so charming - i love it! Always looking for ways to use those dollar store dishtowels, this is genius. Great view - I think we were on that cruise one time! 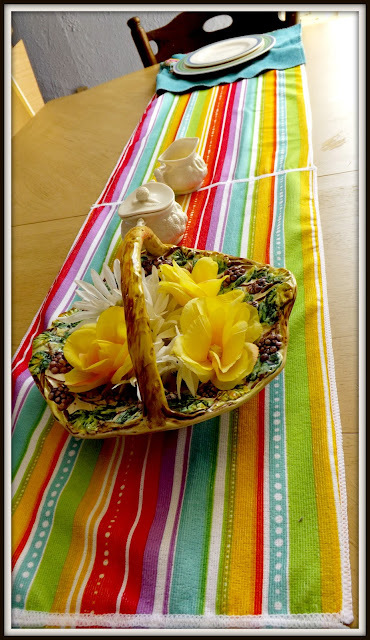 lol The table runner is so cute and colorful -- thanks for the tip on zigzagging to keep the towels flat! Thanks so much for linking on busy Monday!